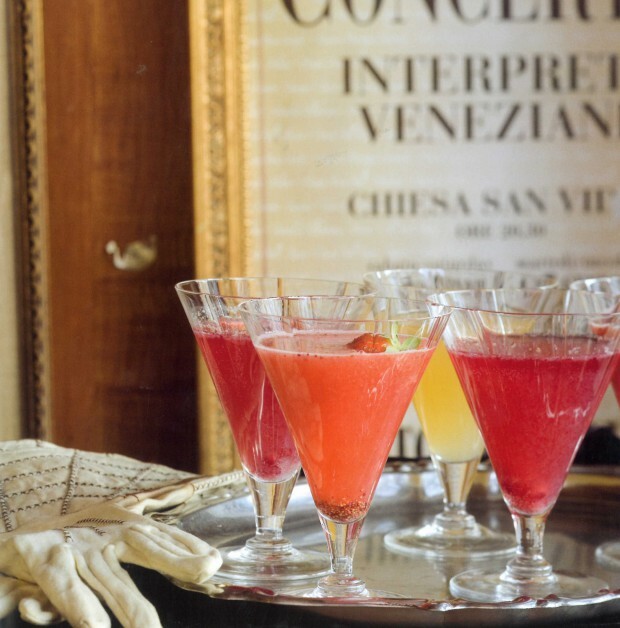 The Bellini was invented sometime between 1934 and 1948 by Giuseppe Cipriani, founder of Harry’s Bar in Venice, Italy. Because of its unique pink color, which reminded Cipriani of the color of the toga of a saint in a painting by 15th-century Venetian artist Giovanni Bellini, he named the drink the Bellini. The drink started as a seasonal specialty at Harry’s Bar, a favorite haunt of Ernest Hemingway, Sinclair Lewis and Orson Welles. Later, it also became popular at the bar’s New York counterpart. After an entrepreneurial Frenchman set up a business to ship fresh white peach pureé to both locations, it was a year-round favorite. Peel your peach with a sharp knife. Halve & stone the peach & purée until smooth. Add a little sugar & a drop of lemon if you like. Taste your purée. Throw in a raspberry into your glass. Pour peach purée into large beautiful well chilled glasses. Stir in the Prosecco and wait for it to settle. Serve at once.